Tatsuya HORITA is a Professor in Department of Human-Social Information Sciences, Graduate School of Information Sciences (GSIS), Tohoku University. He is engaged in research and development on education about media and information society. He has been an Elementary School teacher at Tokyo Metropolitan, Assistant Professor in Faculty of Science and Technology, Nishi-Tokyo University, Associate Professor in Faculty of Education, Toyama University, Associate Professor in Faculty of Informatics, Shizuoka University, Associate Professor in National Institute of Multimedia Education (NIME), Visiting Professor in the Interfaculty Initiative in Information Studies, the University of Tokyo, Professor in Graduate School of Teacher Profession, Tamagawa University, and Advisor to Ministry of Education, Culture, Sports, Science and Technology (MEXT). He has been enthusiastically partnering with schools and classroom teachers to research Media/Information Literacy Education, including curriculum development, instructional design, learning environments and situations, and teacher training. He is also deeply involved in policy making with respect to information education area as a member of such organs of the MEXT. 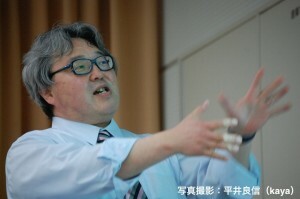 He is the author of “Study about Getting along with Media” (Justsystem, 2004, in Japanese).